From November 22 – December 8, shoppers will have the opportunity to enter a contest for a chance to win an incredible prize basket, containing items from the shops and restaurants at Bishop’s Landing valued at $500! Participating retailers will have ballots on hand during the contest period. The Holiday prize package includes gift cards from Bishop’s Cellar, Alexa Pope, Sugah!, Sea Smoke, a one-night stay at any Premiere Suite property in Halifax, St. John’s, and Moncton, and more. Whether you are out and about or boutique shopping at Bishop’s Landing, make a plan to stay have a leisurely lunch at one of the restaurants. Enjoy all day happy hour at Sea Smoke, and lunch specials at Smiling Goat December 6 – 8. You will be be glad you took a break to enjoy some of the best food and drinks in the city. 20% off bulk candy at Sugah! An impressive tree will be front and centre at Bishop’s Landing throughout the holidays. Join us in merriment as we light the tree at Bishop’s Landing on November 23 at 6:00pm. The holiday spirit will be in full swing as the East Coast Carollers sing and the community comes together. Through November 22 – 24 and December 6 – 8, participating stores will be offering samples while you shop! Try your cider hot for a winter warm up, or taste something new on ice. Bishop’s Cellar will be offering wine tastings from 4-6pm on both weekends and Smiling Goat will be offering coffee samples. Frida is hosting “Luxury on the Rocks”, serving scotch & champagne, and offering items TAX FREE Dec 6-8. 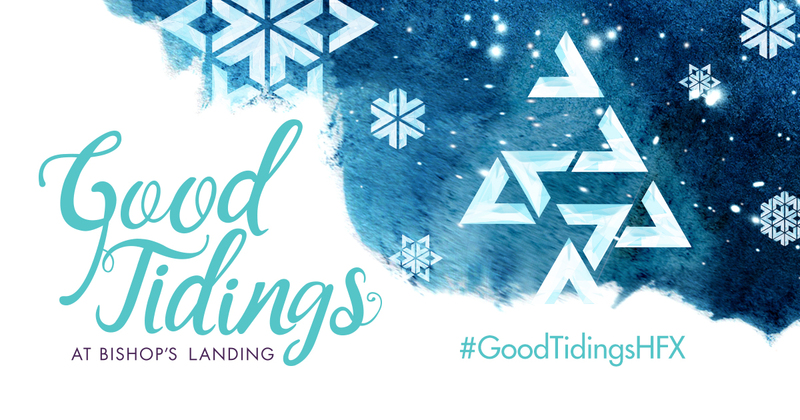 Stay tuned to Bishop’s Landing’s social feeds on Facebook, Twitter, and Instagram for updates on when and where you can get your #GoodTidingsHFX!